As far as recent gaming history goes, No Man’s Sky might just take the cake for its failure in terms of expectations versus reality upon release. In some cases, expectations for a game can be over-hyped by the players themselves, but in the case of No Man’s Sky, founder Sean Murray promised an experience you’d never seen before where the universe was your oyster. What was actually released turned out to be an early-access at best, and any dreams of an epic space voyage turned into dull attempts for survival on mostly repetitive planets. Sure, going into the game without any prior knowledge might have kept you entertained for a couple of hours, but with a $60 price tag, the content just wasn’t there. 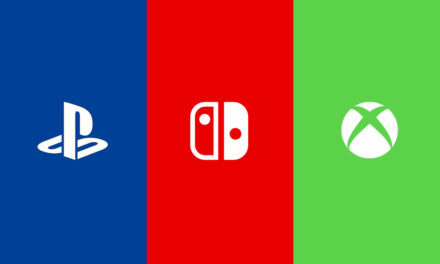 To some extent, players have come to accept that new games will have their fair share of minor bugs upon launch, and the graphics may not be as crisp as seen at E3. The problem with No Man’s Sky is that the game play shown in the lead-up to its release was sold to us as your “average 5, 10 minutes of the game” and heavily focused on the vast amount of discoveries you could make in the world. Everything that was showcased gave the illusion of endless possibilities, but the end result was just….empty. 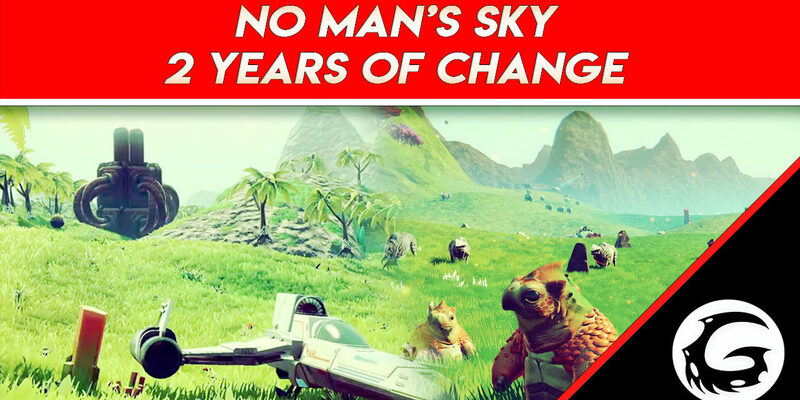 It became the “this is why you shouldn’t pre-order” poster boy, and it seemed that No Man’s Sky would fade into obscurity with all of its problems unresolved. Since the game’s release was way back in 2016, I’ll summarize just a few of the most common complaints, in case you’ve blocked its shortcomings from your memory. Sean Murray declared it almost impossible for players to run into each other due to the vastness of the universe; day one, it happened although it turns out players could not actually see each other. Being a ‘fighter’ of the galaxy turned out to be far less exciting than the name would suggest with sub-par combat and difficult controls. 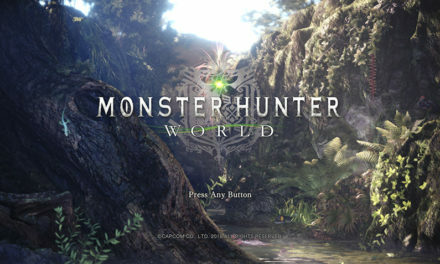 Monstrous animals appeared in various game play videos prior to release, but were impossible to find in reality, and the AI meant that herds of creatures just moved around in the same areas all the time. And when it came to diversity, heading towards the center of the universe spawned more of the same creatures, and even reaching that point ended in what could only be described as a lackluster conclusion. To their credit, rather than melt into the shadows with whatever money was leftover after largely requested refunds, they decided on following a redemption arc. Two years and a few updates later, the product we have now is far more impressive then its day one release, and if you take out its controversial beginnings, what remains is quite a fun experience. That being said, especially as someone who enjoys the latest iteration, No Man’s Sky still remains a bit overpriced at the moment. I do believe that the team at Hello Games will continue to build No Man’s Sky into the game they wanted to create, and based off the content that they’ve released so far, they’re making good headway. 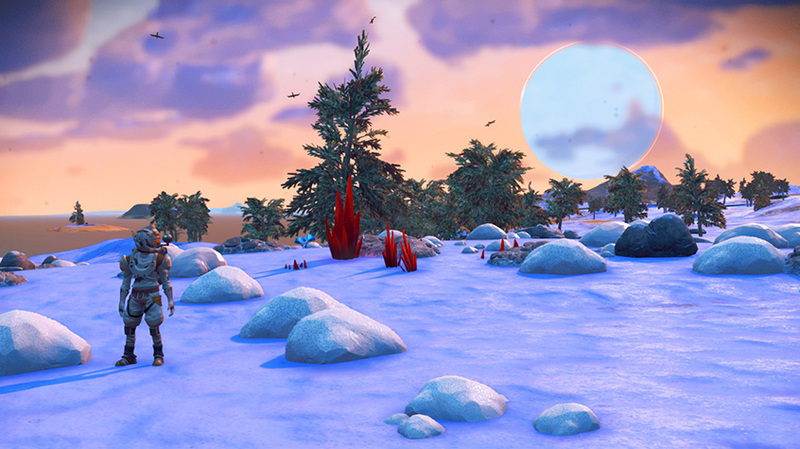 On the aesthetic side, the details in No Man’s Sky have dramatically improved, in terms of detail and lighting, with future patches expected to further amplify the beauty of the universe and the diversity of its biomes. Although the creatures are still weird and sometimes a little clunky, they can be befriended if you feed them the right nutrients, and they’ll show you places of interest in return. Not only does this motivate you to explore, it provides a far more immersive experience and actually instills character into the planets. Base building was a welcome addition back during the Foundation update, and it actually allowed you to feel like a planet-trotting scientist with farmable plants and the ability to shelter when visiting hazardous planets. Underwater bases especially peaked my interest, and with the recent Abyss update adding a large diversity of monsters beneath the sea, taking a dive into the ocean never felt so exciting. Although Hello Games insisted that the No Man’s Sky universe was far too large for a multi-player experience, it’s one of the features that I’m glad they decided to implement. This backtrack made sense to me since the idea of exploring space with your friends, or even running into a stranger on your travels, felt necessary and enticing across a galaxy filled with endless opportunities. Nowadays, players can see their fully-formed friends, and community research missions allow travelers across the universe to aim towards a common goal; a far cry from the floating blue orbs of the past. It’s unsurprising that I still hold a few qualms with No Man’s Sky, but I hope that the future will bring even more positive change. 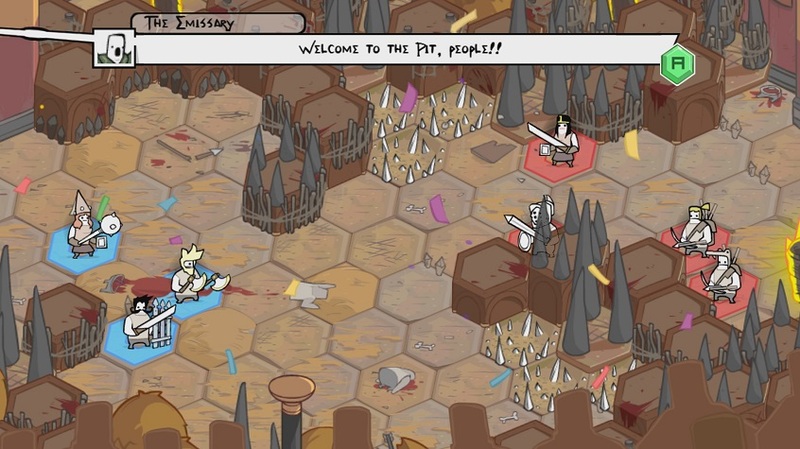 Not long after the beginning of the game, you’ll find that your storage is quickly filled with various elements and you continually have to decide what to throw away (only to have those items required for a quest five minutes later). It comes down to inventory management. I definitely don’t expect players to be able to carry an infinite number of resources, but a few extra spaces, once fully upgraded, would be welcome, or at least the ability to stack more items together. Since most of the planet’s terrain remains similar no matter what part you explore, travelling long distances across a single planet is usually done in search of alien monoliths, trading posts, and damaged machinery. Many complained about the single biome that existed across a planet, and I initially shared this opposition. But what I found was that the game actually needed more diversity within the biomes. If a planet was filled with various biomes from lush forests to toxic wastelands, the game would become an exploration game on-foot, and the notion of travelling from planet to planet would be less appealing; why waste a warp cell when you can take a short trip to the other side of the globe? At the moment, once you land on a planet, the animals you find nearby don’t differ much when you start searching in new areas, and the plants become less impressive as you pass them over and over again. 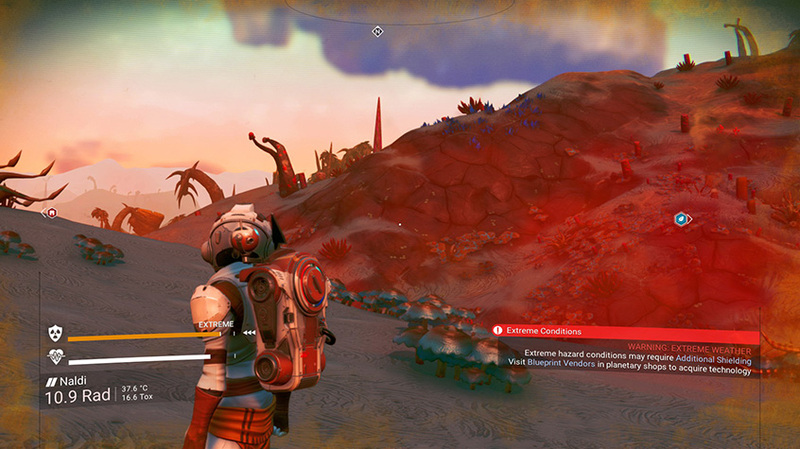 Even the hazardous flora introduced with Visions are common across different planets, and there is no discernible variation in any weather system I’ve seen. It does beg the question: if Hello Games released No Man’s Sky, as it is today, how close would it be to the product we were promised? Take a peek at our of No Man’s Sky NEXT that was released earlier this year if you’re curios. 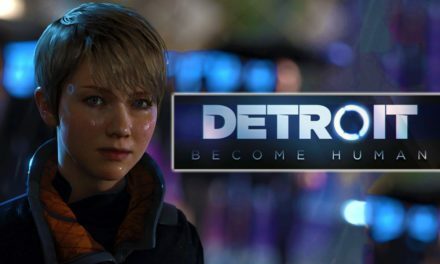 No doubt, the game has made huge strides in terms of what you can discover in the game, which was its major selling point since day one, and they’ve added features that were never mentioned in their marketing campaign. However, No Man’s Sky is not the game of infinite opportunity we were promised, although it seems time has allowed players to forgive its initial shortcomings, due to the efforts of the development team. It is a testament to Hello Games that they’re doing right by the community and building a game worth playing.